Bringing new technology to a well established museum can be a daunting task. 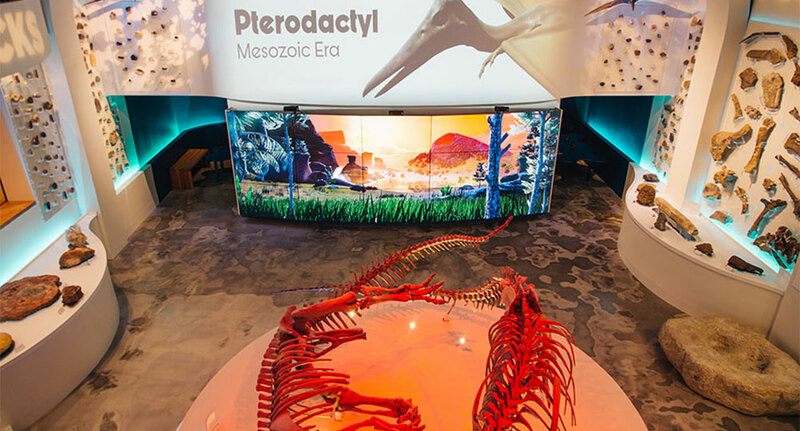 As part of a larger intiative to deepen the presence of technology in their galleries, members of the board at the Fort Worth Museum of Science and History (FWMSH) decided that their DinoLabs exhibition hall would be the right place to start. 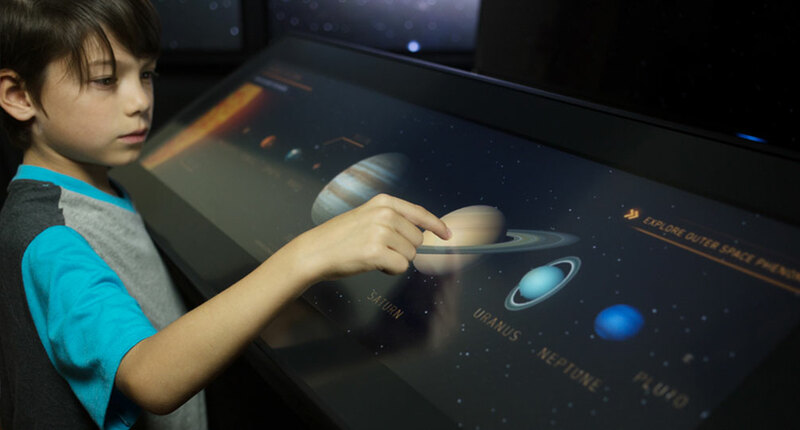 Ideum was thrilled to have the opportunity to work with the team at FWMSH to design two new interactives for DinoLabs. DinoStomp is an experience in which up to ten users can interact with dinosaurs from all Mesozoic eras within an imaginary 3D landscape. For this exhibit, Ideum built a video wall 8’ high and 20’ wide composed of (15) LG 55” monitors, video array controllers, and three Microsoft Kinect motion recognition cameras. Dinosaurs in the 3D scene follow and interact with users as they come within range of the sensors, roaring and leaping according to the motion that is recognized. Over the course of several months, our designers and 3D artists created a scene to fill the enormous video wall (9600 x 3240 pixels). Ideum worked closely with FWMSH to create scene, designing the plants, rock formations, and other elements. Additionally, we designed and brought to life the dinosaurs that appear in the scene. Each dinosaur had to be textured and rigged to achieve a particular look and feel, and each interactive dinosaur species was given a unique roar. 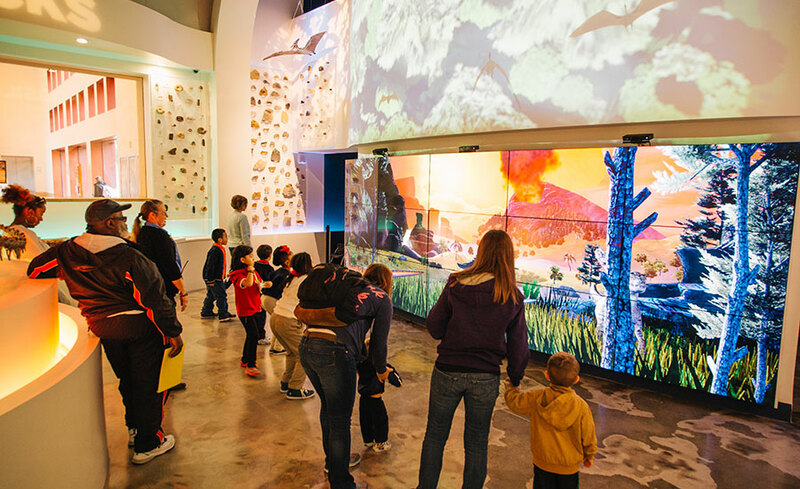 Just as with DinoLand, the other exhibit we developed in cooperation with FWMSH, this installation was completely custom and used emerging technology at a large scale. Both exhibits required early prototyping and testing, along with a clear and consistent focus on the visitor experience throughout the process. You can learn more about the DinoLabs exhibition on the Fort Worth Museum of Science and History website. The 20' video wall allows many guests to engage at once. 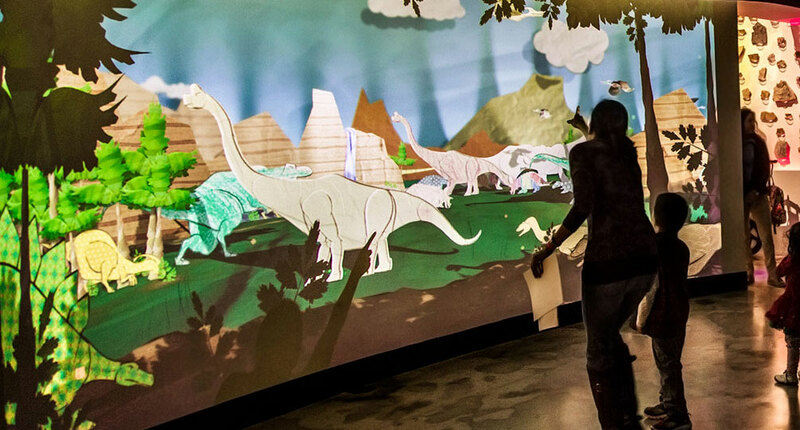 Young museum visitors interact with virtual dinosaurs.